Landscape painting for David Tress is above all about light and space. His compositions – what he calls compositional ‘big ideas’ – are often about the way in which light falls on the land and how light and shadow animate landscape. 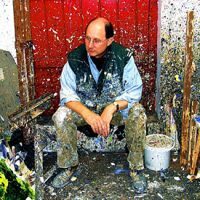 In this 5-day painting landscape course David Tress will explore the theme of ‘Light on the Land’, and look at the building blocks which underlie representational landscape painting – light, space/perspective, tone, colour, composition – and will also consider the ways in which an expressive or emotional response to landscape might be explored. There will be a balance between describing and demonstrating the various painters’ ‘tools’ which allow the making of strong representational paintings and vigorous compositions, and an exploration of risk taking and ‘gut response’ in making landscape paintings which allow and encourage a more expressive approach to the subject. Each day will include demonstrations and studio work, and sketching and drawing in the powerful landscape of the North West Highlands. Tuition will be both as a group, with demonstrations and discussions, and individually. Demonstrations will be in acrylic, some of them using mixed media and collage. We hope as always for good weather when out drawing – but please bring along some stout shoes or boots and waterproof clothing just in case!